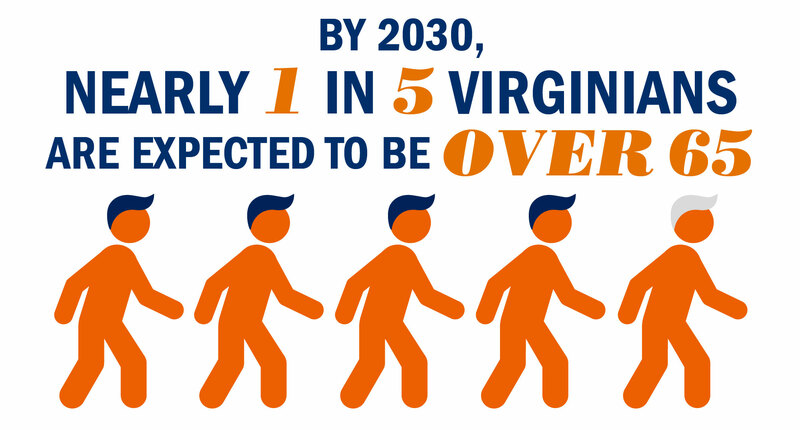 New population projections from the Weldon Cooper Center for Public Service show that Virginia is expected to become the 10th-largest state by 2040. Virginia is expected to leapfrog New Jersey and Michigan to become the nation’s 10th-most-populous state by 2040, when more than 10 million people will live in the commonwealth, according to projections released today by the Demographics Research Group at the University of Virginia’s Weldon Cooper Center for Public Service. 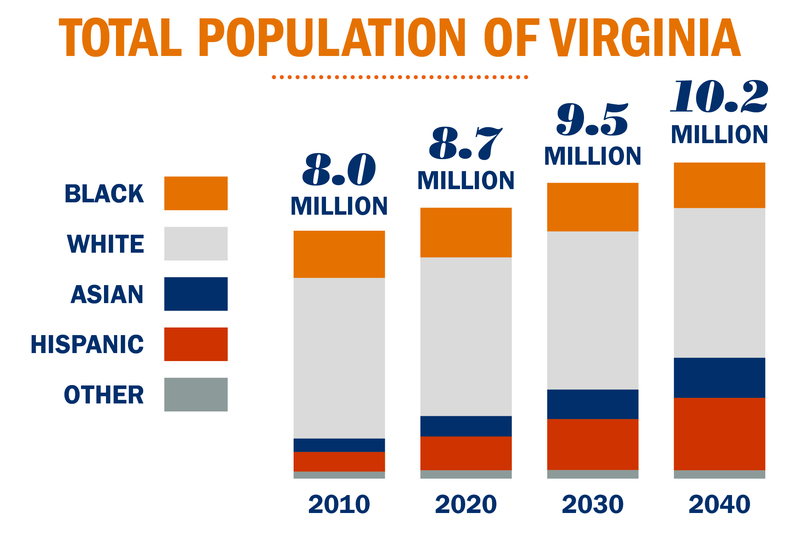 Virginia’s rising population in comparison to other states is based on national population projections that the center released in 2016. The new Virginia projections are the official numbers for the commonwealth and are shared with policymakers around the state for planning purposes. At the same time Virginia’s population is expanding, the rate of population growth is slowing compared to previous decades, which is consistent with a national trend. These official state population projections portray population changes between 2020 and 2040 for Virginia overall, as well as for its 133 counties and cities. In addition to the total population, selected demographic characteristics – including age, gender, race and Hispanic origin – were projected at state and local levels. The share of Virginia’s population living in its largest urban areas, particularly Northern Virginia, is expected to steadily rise. At the same time, most rural Virginia counties are likely to experience slower growth or more population decline than in the past. The divide between urban and rural Virginia is projected to become increasingly sharp, with Virginia’s urban population being younger, growing faster and becoming more racially diverse than most communities in rural Virginia. Two factors are expected to drive population growth in Virginia: more people moving into the commonwealth than moving out, and rapid growth in Virginia’s older population. Advances in medicine and health care have raised life expectancy in past decades, and promise to allow the baby-boom generation to contribute to a growing population of those over 65. By 2030, Virginia’s elderly population is anticipated to nearly double in size, accounting for about one in five Virginians. “Based on our research, the commonwealth should begin preparing for the increased level of health care and support services that this growing population of seniors will require,” said Shonel Sen, lead researcher for population projections at the Demographics Research Group. While the share of residents over 65 is expected to increase across the commonwealth, the growth in seniors will be disproportionality concentrated in rural counties. In a number of counties, the share of residents over 65 may rise to above a third. Virginia’s three largest metropolitan areas – Northern Virginia, Richmond and Hampton Roads – are projected to account for nearly 90 percent of the commonwealth’s total population gains in the coming decades. In contrast, rural communities outside Virginia’s metro areas are expected to experience almost no population growth during the projected time period. The statewide and local projections are available here.